Vin Diesel took to his social media pages and released two new photos from the upcoming seventh installment of the Fast and Furious franchise. Fast and Furious 7 lands April 3, 2015 (seven months from now! ), and according to Diesel, Universal stopped by to show off the film’s trailer and the superstar’s reaction was completely spot-on and we can’t wait to see it ourselves! "Universal came to visit, to show the trailer for FF7," Diesel wrote on his Facebook page with the below photos. "Speechless... yeah, it was that INCREDIBLE! I must also say, that it was emotional and bittersweet... we all went above and beyond to make Pablo proud, but man, I wish he could see what we have created and just how far we have come." And by Pablo he means, of course, the late Paul Walker. 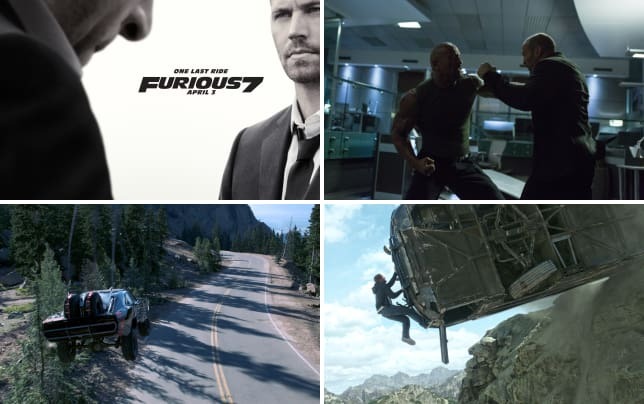 Even though the star's death may have caused an issue or two with the filming of Fast and Furious 7, they managed to work with CG and Walker’s two brothers to finish the film that would be sadly one of Walker’s last. Check out the Fast and Furious 7 photos below, and watch Fast and Furious 6 online to see where we left off.